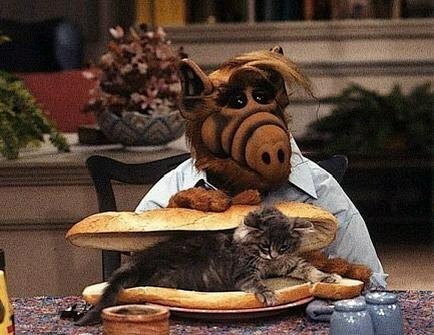 We all remember Alf as the fun-loving Melmacian who lived in the Tanner’s garage and occasionally enjoyed eating the odd cat here and there. However, do you remember how the show ended? If you do, I’m sure you have tried to forget or successful had and this post is bringing back all the terrible memories (and for that I am sorry). So why would this show which was a family classic bring back sad memories? I’m glad you asked that Debbie (that’s right, all of our readers are called Debbie today). The sadness stems from the fact that in the season 4 finale, Alf who is trying to return to Melmac is captured by Alien Task Force. But don’t worry all would be resolved in the premiere the following season. Just one problem with that, the series was cancelled during the summer so this turned out to be the series finale for Alf. So we are left to believe that this Task Force took Alf away to basically be dissected. Take that childhood innocence! *6 years later ABC did air a TV movie called Project Alf which stated that Alf did get away but too little too late in my opinion.